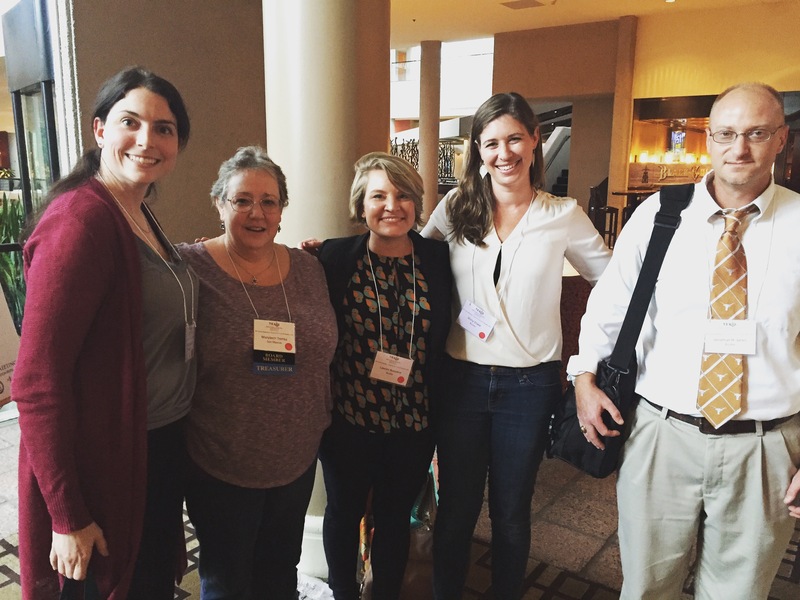 Recently TARL’s staff braved torrential downpours, high winds, and sketchy hotel continental breakfasts to attend the 86th Annual Meeting of the Texas Archeological Society in Houston. We all greatly enjoyed sharing our work with our friends and colleagues, meeting new folks and spending time with old friends. During the meetings, TAS honored TARL Associate Director Jonathan Jarvis for 20 years of membership, and Texas Beyond History director Susan Dial for 30 years of membership in the TAS. We are reminded of how fortunate TARL is to have such dedicated and knowledgeable members of the professional community leading our team! 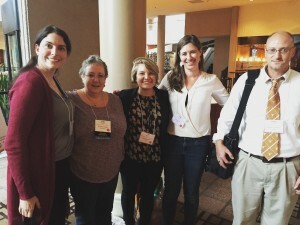 TARL staff had a great time presenting our work at our symposium session, “TARL Today: Projects and Prospects,” and we are grateful to everyone who took the time to come listen to our presentations and offer their feedback on our work. TARL Associate Director Jonathan Jarvis presented on “The Legacy of A. T. Jackson,” providing a fascinating look into the history of TARL’s collections and particularly the many assemblages that were excavated during the WPA era of Texas archaeology. Head of Collections Marybeth Tomka and Curatorial Assistant Lauren Bussiere shared their pilot project—rehabbing one of these WPA-era collections—in their talk “WPA Archaeology: Revisiting the Harrell Site Collections.” TARL Osteologist and NAGPRA Coordinator Stacy Drake discussed her findings regarding “Skeletal Pathologies of Prehistoric Individuals at Falcon Reservoir,” providing a fascinating look into the challenges of salvage projects, and TARL Osteology Intern Jessie LeViseur demonstrated the wealth of new information that can be gained from re-analyzing old collections in her talk, “The Harrell Site: A New Perspective of a Prehistoric Cemetery.” Finally, TARL Director Brian Roberts discussed TARL’s current state and plans for the future in his presentation, “TARL Today.” We hope that our session provided an interesting look into the various projects that keep us busy here at TARL. We were all also glad to have the opportunity to hear about the great projects our colleagues across the state have been conducting. TARL would like to extend our thanks to all the presenters for sharing their work, to our audience members for their interest in TARL and support of our work, and especially to the organizers of the TAS meetings: the Houston Archeological Society, Fort Bend Archeological Society, and Brazoria Archeological Society. Their hard work made this year’s meetings a fun and educational experience for all of us! This richly detailed drawing from the Schild Ledger Book features two men, both carrying rattles and a fan and garbed in elaborate attire. 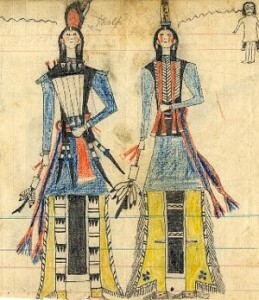 Although a noted Plains Indian artist identified the figures as Kiowa dancers, the enigmatic German text written on the drawing reads, “Ollie Johnson daughter and grandson.” According to notes accompanying the ledger book when it was acquired by The University of Texas, Ollie Johnson was purported to be a Comanche woman who created the paintings. Labels such as these appear on most of the drawings, adding to the mystery of the book’s authorship. TARL Archives. A new Spotlight feature on Texas Beyond History focuses on one of TARL’s most unusual collections. 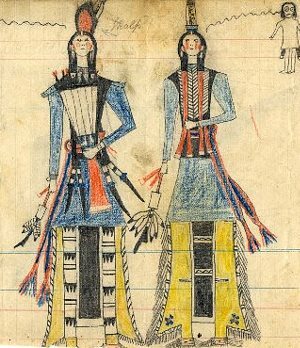 The Schild Ledger book comprises nearly 60 Plains Indian ledger drawings variously ascribed to the Kiowa, Cheyenne, Arapaho, and Comanche. Some are brilliant in color and detail, others mere pencil sketches that were never completed. Known as ledger drawings because of the paper on which they were drawn—typically ruled pages from account books acquired as a gift or through theft or trade—the art was created largely in the last third of the 19th century to portray heroic deeds, tribal traditions, and battles with U.S. soldiers and settlers as the Plains Indian way of life passed into history. Much of what is known about the Schild Ledger Book raises questions—from the identity and tribal affiliation of the artist or artists who created the drawings, to the circumstances of the book coming into the possession of a purported Indian Agent from Fredericksburg, Texas, and ultimately to its being taken abroad to Germany. In this Spotlight feature, we consider clues and possible answers and provide an online gallery of prime examples from the collection for researchers to examine further.